Looking to extend its surprisingly strong season at least one more game, the men’s hockey team traveled to Hamilton this past weekend to take on the top-ranked Continentals in a NESCAC tournament semifinal matchup. Coming off an upset of No. 2 Colby on the road one week ago, the Cardinals went to Clinton, N.Y. with a fire lit underneath them, starting out the game strong before the home team fought back. A valiant effort by the Red and Black made for a thrilling game, but in the end, the favored Continentals emerged victorious. A three-goal third period was ultimately the difference, and a game filled with excitement might leave the Cardinals wondering what could have been. However, no heads will be hung following this game; Wesleyan gave its top-seeded foe all they could handle, and the improvement the team made this year should provide a solid foundation for years to come. Before the game, a number of members garnered prestigious individual accolades. Dylan Holze ’18 efforts last week were recognized, as he was named NESCAC Player of the Week for an inspiring effort to fuel the Cardinal upset over the Mules. Two second period goals along with an assist ensured Wesleyan’s advancement into the NESCAC semifinals for the first time in six seasons. Additionally, second-year defenseman Chad Malinowski was named Second Team All-NESCAC thanks to a 19-point effort this season, which was good for third-best by a defenseman in the conference. 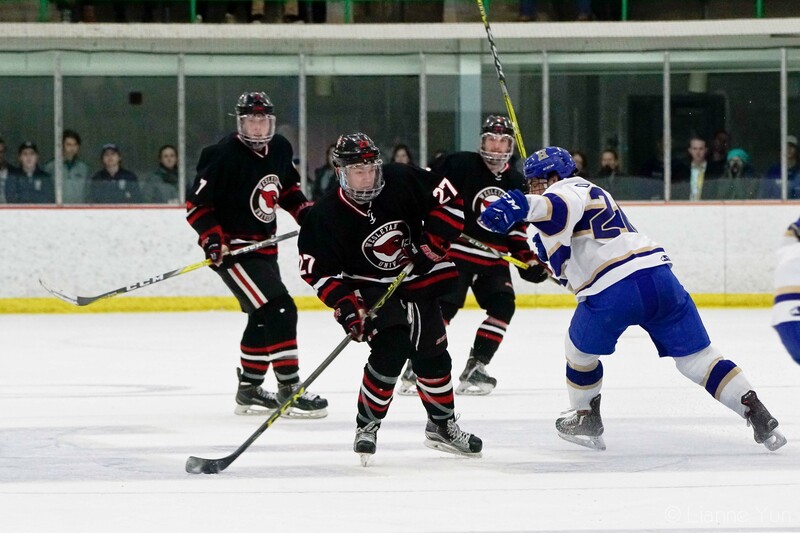 Malinowski propelled a solid Cardinal defense which only allowed a 2.40 goals-against average, in addition to anchoring the top penalty killing unit in all of Division III hockey. Finally, first-year standout forward Walker Harris was named NESCAC Rookie of the Year. A power-play machine, Harris notched 12 points when skating with an extra man, good for second in the conference. The Boulder, Colo. native also ranked second on the team in points with 21, trailing only captain James Kline ’17. Harris’ selection is only the third time in school history that a Cardinal has won the honor; Will Bennett ’04 and Dallas Bossort ’06 were the others. The Cardinals traveled to Hamilton with these honors in hand, and played with the passion that propelled them to success all season long. Cam McCusker ’18 commenced the scoring in the game, when he denied a Continental clear at 7:29 in the first and buried a shot into the back of the net to give Wesleyan the early edge. The lead wouldn’t last long, however, as Hamilton’s Jon Carkeek beat Dawson Sprigings ’17 to find twine just four minutes later. Near the end of the period, Jordan Jancze ’18 fired a shot that Hamilton goaltender Evan Buitenhuis stopped but couldn’t control the rebound; Quincy Oujevolk ’17 was there and converted the friendly bounce into the Cardinals’ second goal of the night. The Cardinals headed into the locker room with the 2-1 lead, before Vincent Lima ’19 stretched the road team’s lead to two points, when he deflected Kline’s shot past Buitenhuis at the 5:19 mark of the second frame. The game was scoreless for the next 13 minutes of play, until Bennett Morrison cut into the Continental deficit at 18:18 of the second. Once again, Wesleyan left the ice for the intermission with a one-goal lead. The first half of the final period remained scoreless, but Conor Lamberti evened up the game for Hamilton at the 10:34 mark. Jancze, however, had an answer, finding the back of the net just under two minutes later with assists from Spencer Fox ’20 and Tyler Wyatt ’20, putting the Cardinals back on top by one. This lead would not last, however. Nick Ursiti scored the game-tying goal at 15:04, giving the home team new life. With their season hanging in the balance, the Cardinals gave the favored Continentals all they could handle, but Ursitti struck once again with just 1:30 remaining, which proved to be the difference in the game and the Cardinals fell by a final of 5-4. The loss means the team will say goodbye to six seniors: Kline, Oujevolk, Robby Harbison, Cole Morrissette, Danny Weiss, and Sprigings. Sprigings, in his last collegiate start, made 26 saves, upping his career total to 2,168 and totaling a save percentage of .904. Kline, who finished with an assist in the game, concluded his career with 83 points in 99 games, including a career-high 26 this year for the senior stalwart. Despite the disappointing result, this year’s Cardinal team made incredible strides on the ice, and their talent and depth should provide a foundation to build upon for years to come. Led by a strong core of players such as Jancze, McCusker, Malinowski, Harris, and goalie George Blinick ’19, the team will hope to improve upon this year’s 13 wins, tied for the most in school history. It will be nine months until the 2017-18 Cardinals take the ice for the first time, but the future looks bright for the Red and Black.